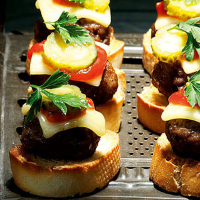 Use the best meatballs you can find for these, and good-quality mature Cheddar slices, too. Preheat the oven to 200°C/gas 6. Put the meatballs on a baking sheet and press to flatten into burgers. Place the bread slices on a grilling rack. Bake these together for 10 minutes or until the burgers have browned and the bread is golden. Pop a square of cheese on top of each burger, then return to the oven for 1 minute until the cheese has melted. Top the toasts with the burgers. Dot each with salsa and finish with a slice of gherkin and a parsley leaf. Serve hot.